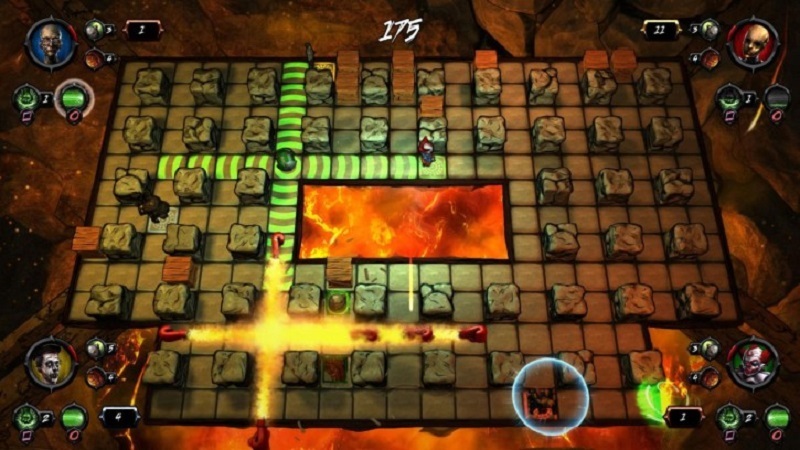 Brawl, from developer Bloober Team is an arcade party game in the tradition of Bomberman. Two or more players run around the map dropping bombs, using their character’s unique skills in an attempt to trick another player into running into the ensuing explosions. It’s fast and simple, making it perfect for couch based competitive play. The other modes, however, are a little more hit or miss. In the single player campaigns, Brawl tells the story of The Emporium. A mysterious place with an ominous name, The Emporium seems to be a sort of twisted island of forgotten toys. Each character has six missions to complete, with tutorial sections designed to teach special abilities followed by a boss fight to test the skills you have learned. 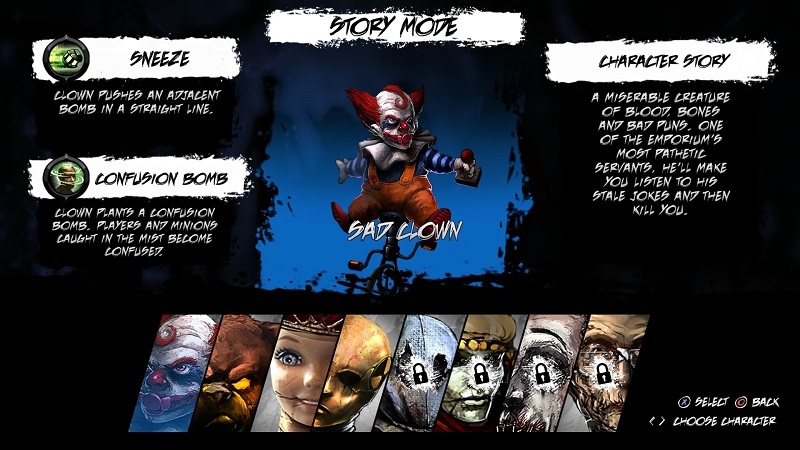 The Sad Clown, for example, can sneeze to launch a bomb across the map or use a confusing gas to reverse a player’s controls, while The Girl can throw a knife to slow her opponents, then teleport to the knife to cover large distances quickly. The overlord of the Emporium narrates these sections, providing the backstory and some dry commentary. The tutorial sections are well done, slowly introducing each character’s special abilities and then providing a puzzle to solve with them. However, after hand-holding the player through these tutorial segments the game pits you against a boss fight more challenging than any real player you are likely to come against. These bosses perfectly dodge your bombs and expertly use their own skills to disable you long enough to die from their own bombs. This drastic spike in difficulty hurts the single player campaign, especially with the narrator making snide comments like “Don’t feel bad, this is where people who are bad at videogames usually die”. Fortunately, local co-op is much better. Playing head to head is exactly what it should be: two or more people on a couch blowing things up and having a good time. The different abilities and playstyles of the characters gives the game a MOBA feel, making each match more than seeing who can dodge bombs the longest. Online multiplayer also exists, although I have yet to successfully confirm that since matchmaking hangs on the seeking players screen without finding any. While this could be a problem with the netcode it is just as likely that nobody is playing online right now. Aside from the punishingly difficult campaign and the non-existent online play, there are a couple of other modes to check out. In single player there is a shepherd mode where you protect a flock of sheep from minions and a horde mode where the goal is simply to survive. For a break from traditional deathmatch you can try a mode that reminds me of Splatoon, where instead of taking out your opponents the goal is to cover as much of the map in paint as possible. There is also sumo mode, which has your bombs explode into boxing gloves with the goal being to knock your opponent outside of the level. Brawl is far from perfect, with an online multiplayer that appears to be devoid of other players and a single player campaign that halts your progress with an insane difficulty spike. Despite these shortcomings it is a solid party game if you have a friend or three that wants to play, and considering how rare it is in this day and age to find a game that supports this kind of multiplayer, I am impressed. If you miss Bomberman and want a game to play with your buddies, I can definitely recommend Brawl. In the end, Spellspire feels like a game that was clearly made for mobile devices and was designed to be played very casually. When it is played on a console, the shortcomings become glaringly apparent. For every positive aspect, every point where the developers seem to make headway into the couch co-op space, there are two negatives staring back at you. Looking at stills, there was a hope that this would manage to be anything other then mediocre, but in practice, both with and without people to play with, ISWB never manages to get out of it's own way. Sadly, in the twinkling night sky of twin stick shooters and simple co-op enjoyments, this star never shines bright enough to attract any notice. But even with that reason in place, I had a lot of fun with this. It's a great little game to play with friends when you just need to kill a bit of time, is very fast-paced with a lot of action, and has a sizable amount of depth to it.